Are your weak hands or feet getting you down? Do you have a hard time walking short distances, or struggle to grasp even the lightest objects? 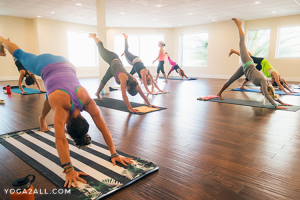 If weakness is negatively affecting your daily life, you may want to consider taking up yoga. Yoga is a great, low-impact way to build strength in the hands and feet. Listed below are five poses that will help you feel stronger and more grounded. Virasana helps stretch the tops of the feet while also improving ankle mobility and increasing your range of motion. A great yoga to build hand and foot strength. To do this pose correctly, start by kneeling on the floor. Your inner knees should be touching with your feet separated slightly wider than the hips. The tops of the feet should be flat on the floor. Sit back between the feet with your torso leaning forward just slightly. You can use your thumbs to draw the flesh of the calf muscles toward your heels so you can sit more comfortably. If you have a hard time sitting comfortably in this pose, try placing a block or bolster between your feet and sitting on it instead. Hold the pose for anywhere from 30 seconds to one minute. Garudasana, or eagle pose, is a balancing pose that requires even distribution of weight throughout the foot to help you stay upright. It also stretches the ankles and improves mobility. Start by standing in Tadasana (also known as Mountain Pose). Bend the knees slightly and lift the left foot, then cross it over your right leg. Once the thighs are crossed and squeezed together, try to wrap the left ankle around the right calf. It’s okay if you can’t quite hook your foot. Stretch the arms forward, then cross the right arm over the left, eventually wrapping the wrists so that your palms can touch. Lift the arms as much as you can while keeping your shoulder blades down. Hold for 15-30 seconds, then switch sides. Kumbhakasana is great for strengthening the hands and wrists while also encouraging flexibility. To do plank pose properly, start on your hands and knees. Place your hands under your shoulders and position your knees so they’re under your hips. Straight your right leg behind you, staying on the ball of the foot. Then, walk the left leg back so your feet meet. Keep your body in a straight line from your head to your feet. Push into the floor with your forearms and spread your palms while keeping your fingers slightly curved to avoid putting too much pressure on the wrists. Hold for 30 seconds, then return to your knees. Simhasana (lion pose) helps keep the fingers flexible while also strengthening the muscles in the hands. To do it properly, you can either kneel on the floor with the right foot crossed over the left. You can also sit on a chair if you have knee problems. Place your palms on your knees, press firmly into them while your spread your palms and fingers out to the side. Your fingers should be arched upward slightly. Once you’re in the proper position, inhale through the nose, then open your mouth wide and exhale while sticking out your tongue and making a “ha” sound. Repeat as many times as you’d like. Follow this advice and your hands and feet will be stronger than ever before! I am truly grateful to the owner of this website who has shared this great paragraph at this place.